Creamware punchbowl, probably made in Staffordshire and decorated in Liverpool. Printed in black with Admiral Rodney (1718-92), whose victory over the French fleet at the Battle of the Saintes in 1782 secured British control of much of the West Indies. The French were in alliance with the American revolutionaries. The Liverpool engraver depicted Washington framed in exactly the same style as his enemy Rodney (see another punchbowl on this site). 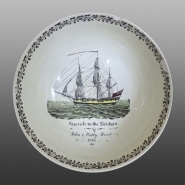 The Liverpool decorators printed punchbowls for both sides in the Revolutionary War, so that each could drink to the health of their hero. The style in which Rodney is framed was developed by Thomas Billinge in Liverpool around 1760 and was by this time old-fashioned. Sir George Bridges Rodney, Baronet, engraving published by Fielding and Walker, 1780. The interior printed with a ship flying the British flag, lightly overpainted in colours. The border is painted, as is the inscription "Success to the Bridget/ John & Betty Hurst/ 1782." 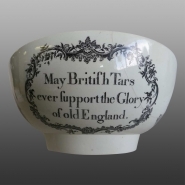 The exterior also printed with the inscription "May British Tars/ ever support the Glory/ of old England." Also with a similarly framed inscription "When this you see/ remember me,/ And bear me in your mind,/ Let all the World/ say what they will,/ Speak of me as you find." The fourth print on the exterior is a scene of a sailor's farewell.